This is a relatively common and frustrating condition seen in dogs. It was previously known as Canine Ulcerative Paradental Stomatitis (C.U.P.S.). Although this condition is seen fairly often in this practice we need to ensure that any presenting ulcerative stomatitis is properly diagnosed to ensure that treatment protocols are appropriate. Three other conditions - Erythema multiforme, Epitheliotropic T-cell lymphoma1 and Wegener's Granulomatosis2 - can present with similar signs and history. (Ref1: Nemec A et al: JSAP (2012) 53, 445-452) (Ref2: Krug W et al: J Vet Dent (2006) 23 (4), 231-236). Before the CCUS protocol as applied these condition must be eliminated from the differential diagnosis. Practitioners should note that this is not the very common disease of periodontal disease but mostly a paradental disease. This means that it does not generally affect the tissues that attach the tooth to the socket (gingiva, alveolar bone, periodontal ligament and cementum on the root) but those close to, or overlying it – gingiva plus oral mucosa, tongue, pharynx etc. Many specialists think that in 5% to 10% of cases, this condition can be seen concurrently with other immune mediated diseases such as immune-mediated haemolytic anaemia (IMHA), immune-mediated thrombocytopenia (ITP), pemphigus or lupus (SLE). The above images show severe mucosal inflammation in tissues overlying the teeth. Note that the teeth do not look as if there is heavy calculus accumulation or gingival recession. In normal dogs the oral soft tissues such as buccal or vestibular mucosa, tongue, pharynx etc remain healthy in the face of severe, chronic, advanced disease of the periodontal tissues. Conversely, we often find that in severe cases of CUPS the teeth are generally periodontally quite healthy. Note the intense inflammation and ulceration of those areas of oral mucosa that lie against the crowns of the teeth. These are sometimes called contact or kissing ulcers. We commonly also see contact ulcers in the area of the maxillary canines. Note the ulceration and inflammation of the palatal mucosa also. This mouth is very painful and halitosis is marked. CCUS and periodontal disease is two separate conditions that may be present on their own or together. Certain breeds such as Greyhounds and Labradors seem more susceptible to CCUS than the general population. Owners usually complain initially of severe halitosis and, possibly, dysphagia but another common sign is excessive salivation of a thick, stringy, viscous nature. The saliva is sometimes blood stained. In some dogs we also see an extension of the inflammatory process to the skin of the lips folds. The most common findings are therefore halitosis, oral pain and difficulty eating. CCUS and periodontal disease are two separate conditions that may be present singly or together. Note the lack of lesions where no teeth are present. This edentulous area had teeth removed some time previously. Differential diagnosis would include pemphigus and bullous pemphigoid in addition to the three conditions noted above - Erythema multiforme, Epitheliotropic T-cell lymphoma and Wegener's Granulomatosis. While these conditions can result in oral lesions, they may be associated with lesions of the skin and mucous membranes in other areas of the body. Since the treatment for other immune-mediated diseases is very different from the treatment for CCUS, it is important to make the distinction early on in the management of the case. Therefore histology plus immunohistochemistry and clonality testing is wise. A full haematology and biochemistry panel will help confirm good health status of the patient before starting treatment. The blood samples also help regarding the ability of the dog to undergo medical treatment that may include NSAID’s or corticosteroids. Ruling out infectious causes for animals about to undergo immunosuppresive therapy is also important. Swabs for bacteriology are often not helpful. Many bacterial species can be isolated from sulcus or mucosal swabs but their significance can be hard to determine unless they are unusual for the mouth or present in pure culture. Ask the lab before sending your swabs how they want them sent for anaerobic and aerobic culture. Tissue culture and/or rRNA sequencing may be required to disclose organisms not seen on histopathology. We do not know the precise aetiology of CCUS. We do know that these individuals have an abnormal immune system response and appear intolerant of dental plaque. Any small amount of plaque leads to a greater than normal level of local inflammatory reaction in these individuals. 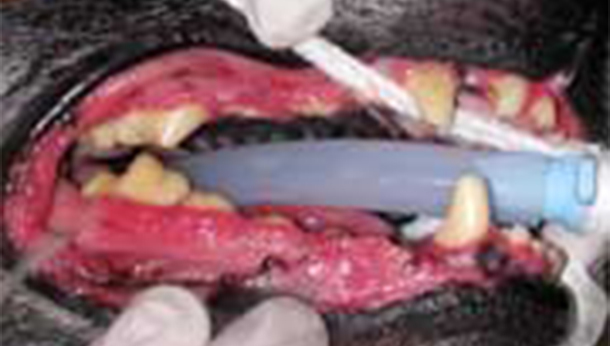 The initial focus by both vet and owner must be scrupulous plaque control. Management of the case always starts with a diligent, professional scale and polish. Teeth that have a limited future, perhaps due to periodontal disease, should be removed. The practice must practice zero tolerance towards oral antigens and pathology. 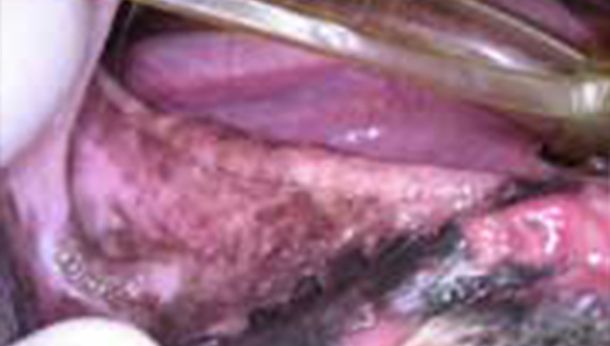 In this regard, these cases are very similar to Feline Chronic Gingivitis Stomatitis syndrome (FCGS) cases in cats as they are also intolerant to normal levels of dental plaque. Control measures are generally for life. Training the client to use disclosing solution every few days allows them to see how effective their control measures are and, also, where and how much plaque there is on the teeth. They can use PlaqSearch from Henry Schein Animal Health or Molar Ltd. Bottles are very inexpensive. A cotton bud is coated with the liquid and painted on the teeth to disclose the plaque which otherwise is not visible. The images below show a mouth one week after a scale and polish. Once disclosing solution is applied the owner can see clearly where the problems are. Our control measure centre on the following professional dental treatment has been performed. There are many tools in box as cases vary widely in response. It is essential that proper cleaning is performed first before drugs are used. Diligent twice daily removal of plaque with a chlorhexidine based product. This can be a spray, rinse or a gel/toothpaste. Good chlorhexidine products that animals will tolerate can be hard to source. Our favourite is HS Pet Care Chlorhexidine Paste 0.12% (Henry Schein Animal Health; order code 9009502). Petdent gel is also easily available from veterinary wholesalers and well tolerated by dogs and cats. The HS product range also includes a pump spray (HS Pet Care Chlorhexidine Gluconate Spray) in addition to a gel for use intra operatively called HS Chlorhexidine Gel Kit. Tooth brushing may be hard to achieve until the lesions are under control. Until the oral pain settles wipe the gel inside the lips to start with. Once the lesions improve you can advise use of a soft bristle toothbrush cheaply obtained from Boots or Tesco. Beware of some of the ludicrous inventions that masquerade as pet tooth brushes. The toothbrush, as a design, has been good for 200 years. An inexpensive brush can be thrown away every 6 - 8 weeks once the bristles are frayed. So - when the lesions are active & brushing is hard wipe the paste inside the lips both sides instead. Brushing should be resumed as soon as possible. The pump spray (HS order code 9009503) is an alternative. Frequent professional scaling and polishing when the control measures are failing and soft tissue lesions are returning. This might mean as often as every 3 - 4 months. The owner must be aware of this. Teeth affected by periodontal disease that may have gingival recession and/or pocket formation are likely to stoke to inflammatory fires further. These teeth should be extracted in a timely manner. Some authors advocate full mouth extractions for these cases. In our experience this is rarely necessary as long as control measures are used properly. For some dogs full mouth extraction may be the only solution. SANOS is a polymer applied to the gingival sulcus post-op. It works by blocking access to the sulcus by antigen. We find it very useful if daily brushing is likely to be difficult in the short to medium term. Occasional and controlled medical treatment is likely to be needed in most cases. We have a triple combination of drugs we use in many cases once the initial cleaning and necessary extractions have been done. This includes Pentoxifylline, Vitamin B3 (Niacin) and submicrobial doses of Doxycycline. Antibiotics can be useful early in the case but generally do not help much long term. Corticosteroids may be used in some extreme cases as rescue therapy. The lowest effective dose levels of prednisolone used under strict control may bring soft tissue lesions under control and allow plaque reduction measures. Do not forget pain control! NSAID's plus opiates will be required if lesions are severe. Tramadol at 2-5mg/kg q6-12h might be needed initially. Gabapentin is also used by many specialists at a dose of 11mg/kg q8h. Make sure everyone involved understands the need to demonstrate and control dental plaque. It cannot be seen without disclosing solution. There are good reports of the use of the HealthyMouth range of products to assist in plaque control. This product has seven VOHC seals of approval - see below. This means the data has been independently reviewed. What is the role of other rinses and so-called “treatments” for dental disease? Many of these are unproven and sold on the basis of "sales literature" and spurious “trials”. Products that are not strictly medicines do not require rigorous testing for efficacy and safety. If you think that the product in question is likely to be any good why not ask your dentist if he would use it for you in the same circumstances. That might be enough of a reality check to save you spending cash on snake oil and rubbish. The Veterinary Oral Health Council (www.vohc.org) exists to review these products. It is a not for profit organisation in which senior academics and specialists review company literature and provide approval if claims appear to be valid. The website lists products that have this seal of approval. If it's not there you might want to ask why!